Concrete is much stronger than other foundation materials. What’s more, it actually gains strength when it ages. 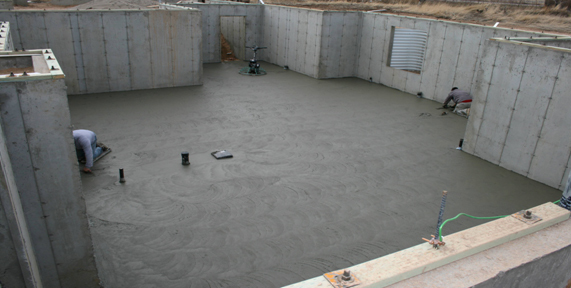 Solid concrete has an ultimate compressive strength far greater than any other form of foundation. It acts as a natural barrier against such natural disasters like tornadoes or floods. Statistics show one-third of all home fires start in the basement. That’s why it’s so important that a concrete basement has zero flame spread — it will not support combustion. A concrete basement is a single, solid unit with truly monolithic construction. It will withstand the test of time. Plus outlast your mortgage. You get 40% more concrete dollar-for-dollar in a poured, solid concrete basement. That means it’s denser and has fewer pores or seams for water to seep through. Because of its advantages, a solid concrete basement adds value to a home. This results in a greater return on investment at resale time. Solid concrete walls provide more finishing options. Some homeowners apply tiles, wallcovering or carpet directly to concrete walls. Others paint. Some use furring strips, adhesive or studs for wood paneling. Clean, high-quality concrete construction allows you to spend your time and money doing what you enjoy, not working on basement problems. Solid concrete walls do not rot or support termites. Is the difference really important? Yes! Block walls have joints and seams that can allow water infiltration, drafts, mold, and insects inside the structure. Block walls are more prone to bowing, leaking and structural damage. Block walls are hollow, not solid, and may still require concrete be pumped inside for additional strength required to meet building codes. Block walls take more time to erect, increasing labor expense, project costs and overall construction time. Block walls require specialized crews that may be readily available when you need them. Concrete is a better way to build!